The final Budweiser Late Model Shootout of the 4 day Memorial Day swing was held on Memorial Day, May 27th at the Davenport Speedway. Mother nature again smiled on Simmons Promotions providing a beautiful night for racing. 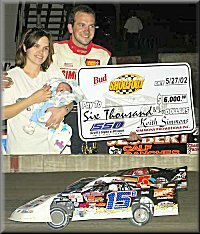 The 50 lap Bud Shootout belonged to Brian Birkhofer making the third time in three Bud Shootout starts that the #15 visited victory lane. Birkhofer scored a clean sweep on Monday night taking the third heat win, the Hollywood Graphics fast dash and the main event. Birkhofer started the feature from the pole position but trailed Jay Johnson for the first seven laps. Johnson jumped the cushion and contacted the retaining wall and went to the infield to make minor repairs on a lap seven restart. Birkhofer took the point on the restart and went on to lead the remaining 43 laps. A late race restart set up a seven lap dash to the finish but Birkhofer was able to pull away for the $6,000 win. Ray Guss Jr. started 15th and steadily worked to the front taking second at the checkers ahead of Kurt Stewart, who turned in a fine performance. Gary Webb passed the most cars, starting in 25th and coming all the way up to fourth. Darren Miller rounded out the top five. In addition to the Budweiser Late Models the Pro Stocks and Hobby Stocks were also in action. The Pro Stock feature was won by Andy Eckrich taking the checkers ahead of Rusty Daufeldt. The Hobby Stock feature win went to T.J. Leslein crossing the finish line ahead of Jim Turpin. 4. 00 Mitch Johnson-Fargo, N.D.